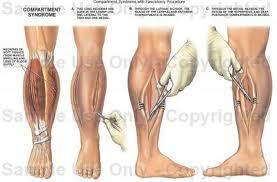 A compartment syndrome is the result of an increase in pressure within the compartments of the lower leg. * Deep posterior compartment syndrome is common as well. Acute compartment syndrome is treated with an immediate fasciotomy – a surgical procedure where fascia is cut to relieve pressure or tension. Chronic compartment syndrome can be treated conservatively with rest and stretching. If this fails, fasciotomy is performed. AF dorsiflexion, extension ( toes) and inversion difficult due to pain. Passive stretch of affected compartment is painful. A client with acute compartment syndrome is immediately referred for medical attention. Palpation of affected compartment may reveal tightness and defects in the fascia from continued pressure. 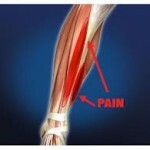 Tibial Stress Fracture – pain is sharp and local to fracture site. Pain becomes constant and worse with impact.